So far, 2017 has mostly been a continuation of the two previous years. The much hyped tweaking of cooling measures (the shortening of the SSD, and removal of TDSR requirements for home equity loans) hasn’t had too much of an impact. And to be frank, if anyone had listened to the government statements, they’d know the measures were never a sign of “unwinding” cooling measures in the first place. The overall economy continues to weigh down the property market, particularly the rental market. Whenever big money sectors like oil and gas or finance get hit, landlords struggle as well. Those are the industries that send high income expatriates to our shores, and lay-offs or shrinking housing allowances affect how those expats rent. We may be seeing a lot of fallout from the two previous years, and there’s no guarantee the hard times are over. 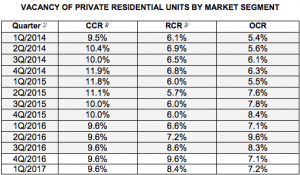 Note that the higher vacancy rates in the Core Central Region (CCR) are a norm, given that many properties in such areas (Orchard, Tanglin, etc.) are bought to be rented out rather than lived in. Also, during economic downturns such as the present, a handful of tenants might downgrade from these high end properties to Rest of Central Region (RCR) properties. Also, recall that the two main sectors that suffered in 2015 and 2016 were oil and gas, followed by finance; these are industries that brought in many of the well-heeled expatriates. Those expats were a major demographic in CCR rentals. The fall in vacancies in Q2 is hard to explain. It could be due to people moving into the units they intended to rent out. For example, if you’re pissed off about having to rent out your condo for $2,500 a month, you might decide to just forego the rental income and let your son move in. Or it could also be due to people using untenanted units as weekend homes, or even just a misreading based on power and water usage (real estate agents who aggressively conduct showings – not uncommon in bad times – can rack up water and power usage. This could cause the property to be read as occupied). If you want to be optimistic, you could also believe that rental incomes have hit the bottom and we’re at an inflection point. But mention that to any agent or landlord, and you’re likely to receive a loud snort and a black face. 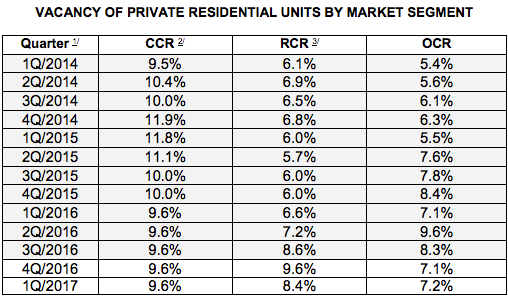 The above shows supply and take-up rates of private residential properties. 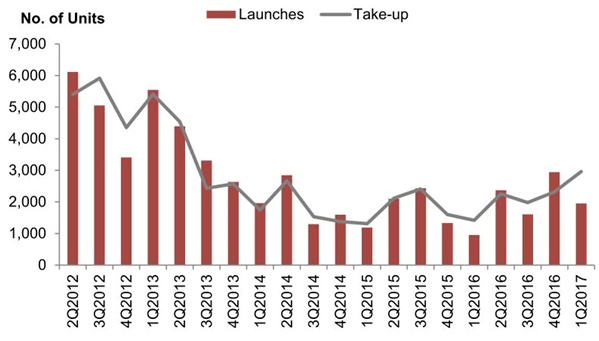 Notice that during most quarters, the take-up rate closely matches the number of launches. It’s important the the supply of new units be controlled, so we don’t end up with a lot of wasteful, unoccupied units. 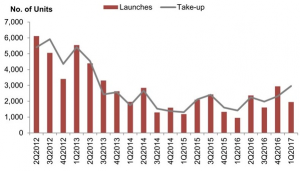 Now in Q1 2017, the supply of new launches was below the take-up rate, which means we launched fewer properties than people actually moved into. This helps a bit with the growing oversupply issue. “A total supply of 46,016 (including 4,433 units of EC) is in the pipeline from 1Q2017 till 2021 and a total of 18,870 consisting of 15,930 (Private residential) + 2,940 (EC) remained unsold. However, we have to be mindful of one big issue: we haven’t taken into account the supply of HDB units, whether through resale or BTO launches. It’s difficult to quantify the exact impact of HDB supply on the private housing market; but we have to consider issues such as potential upgraders changing their mind, given the state of the economy. It might be presumptuous to declare an end to any oversupply issues, even if the situation seems to have improved. According to Singstat numbers, the average household size in 2015 was 3.39 persons per home. This is down from 3.5 in the year 2000, and way down from 4.25 in the 1990’s. Singapore is on its way to being on par with countries like the United States (2.6), which has a stronger culture of independent living. 3.39 is quite low, considering 90.8 per cent of people own their own homes. As such, the falling number could reflect on more people moving into their private units, rather than renting them out. Or it could mean there’s a cultural shift, such as people moving out while younger or before they’re married. The United States Federal Reserve (the Fed) has plans for three to four interest rate hikes this year, as part of their plan to “normalise”. Interest rates have been abnormally low since 2008, when the Fed set interest rates to zero to stimulate economic recovery. The Fed rate hikes always impact Singapore eventually, by affecting the Singapore Interbank Offered Rate (SIBOR), or the Swap Offer Rate (SOR). This is because the Singapore dollar trades according to something called the $NEER band; the Monetary Authority of Singapore (MAS) allows the SGD value to float based on an undisclosed basket of currencies, with different weightage based on trade ties to Singapore. While it’s undisclosed, the USD is one of those currencies, and its impact is probably not minimal. Because, you know, the world’s sole superpower and all. The Fed’s planned rate hikes are almost inevitable at this point, given the combination of job recovery in the US, and Donald Trump. The planned tax cuts from Trump’s administration would act as a stimulus measure, and the Fed will hike rates to combat any potential inflation that results from it. This is all bad news for landlords, as rising interest rates mean more costs, which in turn translates to lower rental yields. Note that, while SIBOR and SOR rates move in tandem, SOR is likely to be much more volatile as it’s a Forex implied rate. Anyone on a SOR based package had best consider refinancing, given the situation. You can speak to one of our expert mortgage brokers for help. Actually, if you’re worried about rising interest rates at all, speak to us for help; we can find the best possible deal for you among all the local banks. To get the full report, or send your questions, drop a message to iCompareLoan.com. We have tools and data to empower both home owners, as well as real estate professionals.